French Alps are the most popular place for ski holidays. If you are looking for a ski resort that is not overcrowded but offers world-class skiing options for the whole family then look no further - Val Cenis is the right choice. We at Alps2Alps will be more than happy to be you transfer provider from your chosen airport to this pearl of French Alps. Val Cenis is situated on the French-Italian border near the oldest National park of France - Vanoise. It is composed of two authentic Savoyard villages, that contain treasures of architecture and sculpture. The ski resort offers modern lift system and uncrowded sunny slopes for all tastes. Noticeable that the lower section of the slopes are through trees, which means they are not exposed to sun and wind and tend to have better snow cover. There are no direct trains to Val Cenis. The closest train station is Modane - daily bus connections from the train station to Val Cenis are provided. When choosing your transfer service provider to Val Cenis, be sure that Alps2Alps will offer the best price possible - our main goal is to provide the lowest price with best service. If you are traveling to Val Cenis in the off-season and off-peak time, you can count on great discounts and remember that if you choose your transfer in midweek (Monday-Friday), the prices will be lower than weekend prices (they can be up to 60%). Apart from factors mentioned above, your final transfer price will be also influenced by vehicle availability, transfer schedule, vehicle utilization and other costs like airport parking charges and road tolls. To discuss any specific requirements that you have or your plans to travel as a larger group, please get in touch directly so we can discuss this. Winter sports enthusiasts love Val Cenis because of the variety of pistes and it the fact, that it is not overcrowded, therefore you can enjoy your ski holidays in a calm and quiet atmosphere. 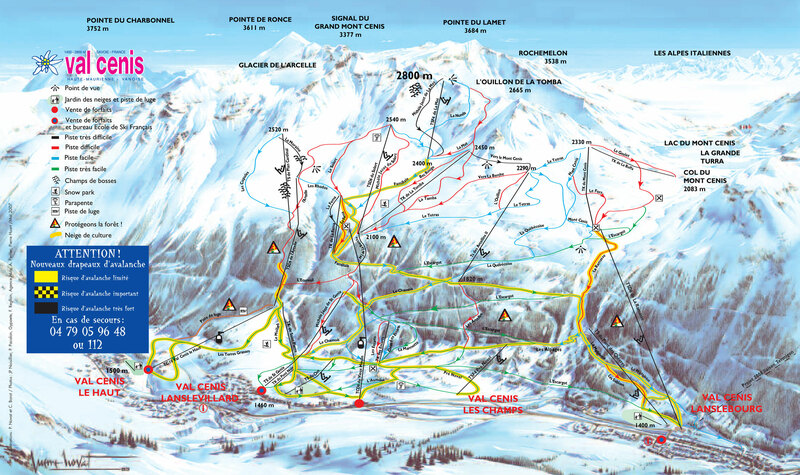 Val Cenis is not only quiet but also a family friendly ski resort. Local ski schools will be the best place to improve skiing skill levels for the whole family - there are three ski schools for you to chose. There are reductions on ski passes for large families. Plenty of off-ski activities (even ice climbing, dog sledding are offered), breathtaking views and even halfpipe and boardercross courses for snowboarders all make the Val Cenis the ski resort worth visiting. If you are in search of best possible transfer deal to Val Cenis, then Alps2Alps will be the right choice. During peak season, transfers tend to fill up fast - therefore book your transfer early to have a great start of ski holidays. Whatever it takes to get you there in comfort and on time, you can count on Alps2Alps - we are reachable 24/7!